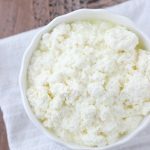 Making homemade ricotta or the Slavic version, farmer’s cheese, is so easy and only takes 2 ingredients. The texture and flavor is so perfect, it beats store-bought by a mile and is so much more economical. 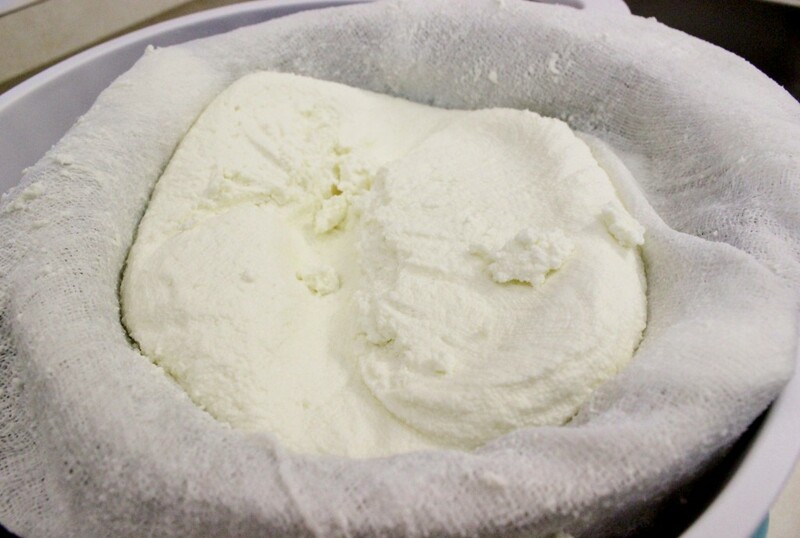 Ricotta/Farmer’s cheese is a soft cheese that is made by curdling milk and then packing it in cheesecloth to drain out the whey. My mom has always made homemade farmer’s cheese at home and I picked up this skill too. 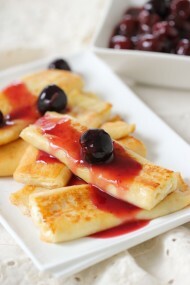 Not only is it a fantastic snack – my boys love it with fresh berries or jam, but there are so many ways other ways to enjoy it – cheese blintzes, as fillings in cookie bars, yeast breads, pastries, vareniki (Russian ravioli, both sweet and savory), lasagna. I have tons of recipes that will feature it perfectly. Since I got my Instant Pot, I have been making ricotta in there. 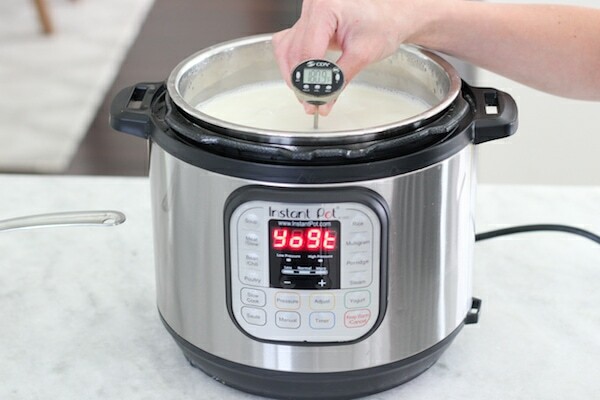 It’s just as easy to use a regular large pot or dutch oven, but the Instant Pot that has the “Yogurt” setting makes it even easier, because you don’t have to worry about the milk scorching or boiling over. I will include both methods in this recipe. Pour the milk into a large pot and heat the milk over medium-low heat until it reaches 180-185 degrees Fahrenheit, about 10-15 minutes. The milk will look frothy. Stir it frequently and keep it under strict supervision; you don’t want the milk to scorch or boil over. 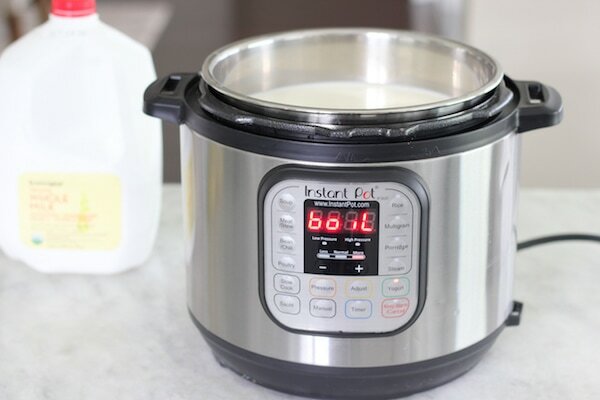 If you are using the Instant Pot, pour in the milk in the inner chamber and set it to the “Yogurt” setting, adjusting it to “boil”. While you are waiting for the milk to boil, squeeze the lemon juice. I use a small sieve to strain the lemon juice. When the milk reaches 180-185 degrees Fahrenheit, take it off the heat and slowly pour in the lemon juice, stirring gently in a circular motion. Be careful not to mix it too vigorously, or the cheese will be grainy in texture. Allow it to stand for about 5-7 minutes. Place a fine mesh sieve or a colander over a large bowl. Put a cheesecloth over the sieve. Gently start scooping out the curds, transferring the cheese to the cheesecloth lined sieve. 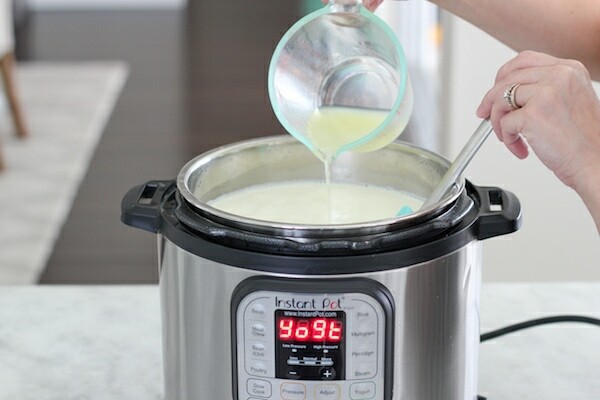 If the milk has already started to cool and the curds still don’t separate from the whey, return to the heat and cook over low heat for a few minutes. That should do the trick. Continue gently scooping out the cheese curds until they are all in the cheesecloth. Pour out the strained out whey, either discarding it or saving it for another use. Use the whey to make crepes or bread. It’s really easy; just substitute the whey for the amount of liquid in your recipe. Store the whey in the refrigerator. I usually use my handy dandy canning jars. Let sit, undisturbed, until whey has drained from edges of cheese but center is still somewhat moist, about 8 minutes. Transfer the cheese to large bowl, retaining some of the whey that was left in the center. Stir well to break up large curds and incorporate whey. 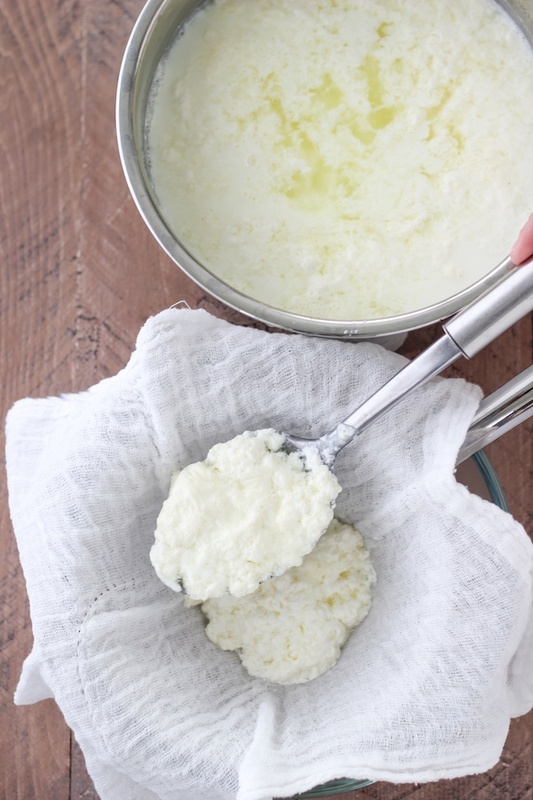 Refrigerate ricotta until cold, about 2 hours. Stir cheese before using. 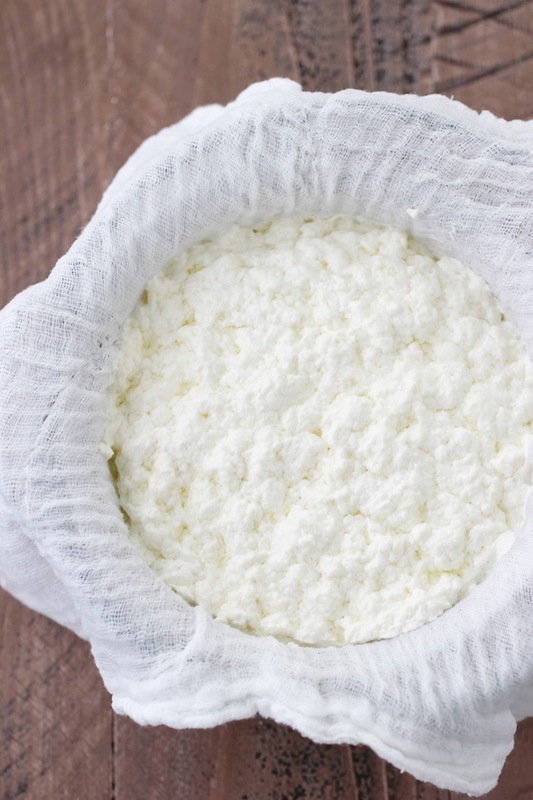 If you want the cheese to have a dryer texture, more like farmer’s cheese, let it drain for a longer period of time, up to a few hours in the refrigerator. Store in a covered container, refrigerated, up to a week. Gently start scooping out the curds, transferring the cheese to the cheesecloth lined sieve. 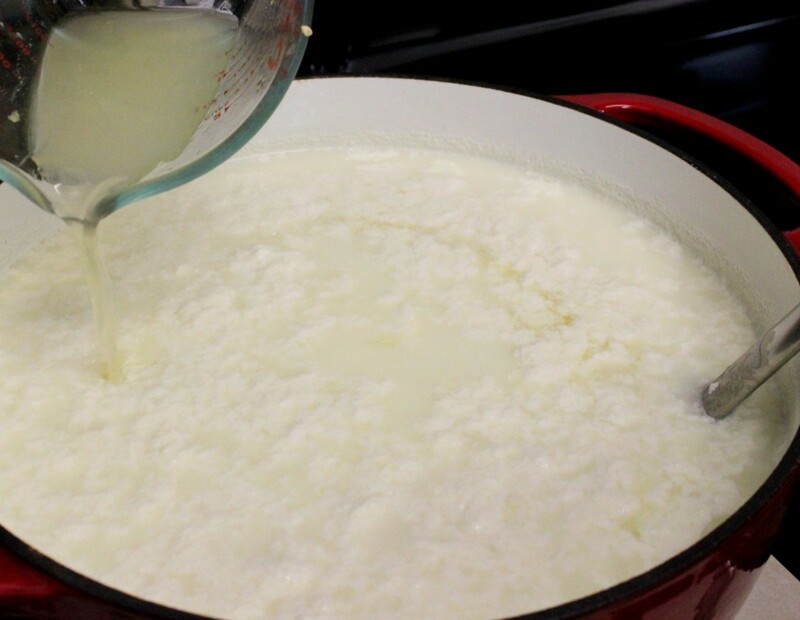 If the milk has already started to cool and the curds still don’t separate from the whey, return to the heat and cook over low heat for a few minutes. That should do the trick. Continue gently scooping out the cheese curds until they are all in the cheesecloth. Pour out the strained out whey, either discarding it or saving it for another use. Store in a covered container. Use the whey to make crepes or bread. It’s really easy; just substitute the whey for the amount of liquid in your recipe. Store the whey in the refrigerator. I usually use my handy dandy canning jars. I have to try to make farmers cheese using your recipe. I do it differently, I heat a gallon on milk and then add half a gallon of buttermilk. I let it stand over night and then for 15-20 min I put it in the oven, when it cools down I transfer it to colander and etc. I usually do mine from butter milk, it turns out really good. Your husband makes cheese? How cool is that? Yep, this recipe can be made with lemon juice or vinegar. I love how easy farmer’s cheese is to make! I’ve made tvorog before many times because I bought raw milk cheap by the gallon. I’d skim the cream and probably have about 1% give or take. Then I met some Russian friends who used all buttermilk, it was a lot creamier. I like mine dryers because I like adding sour cream to it with salt or sugar. So, my question is you like whole milk because of the richness? Are the results less with skim? I’d love to make those cookies with tvorog I saw on your blog. Your pics are very good. I’ve tried food photography before and wasn’t good at it. What did you find helpful in taking such mouth watering pics? Thank you! I’ve made farmer’s cheese with 2% milk before (that’s what we usually drink), and it’s turned out fine too. Farmer’s cheese can certainly be made with skim milk or buttermilk. When you use whole milk, you will get a bigger yield of cheese and the texture will be creamier. You will get a lot more farmer’s cheese from a gallon of whole milk than you will from a gallon of skim milk. I prefer the texture of this cheese too. You can make it as dry as you like by draining it more. Thank you for your kind words about the pictures. 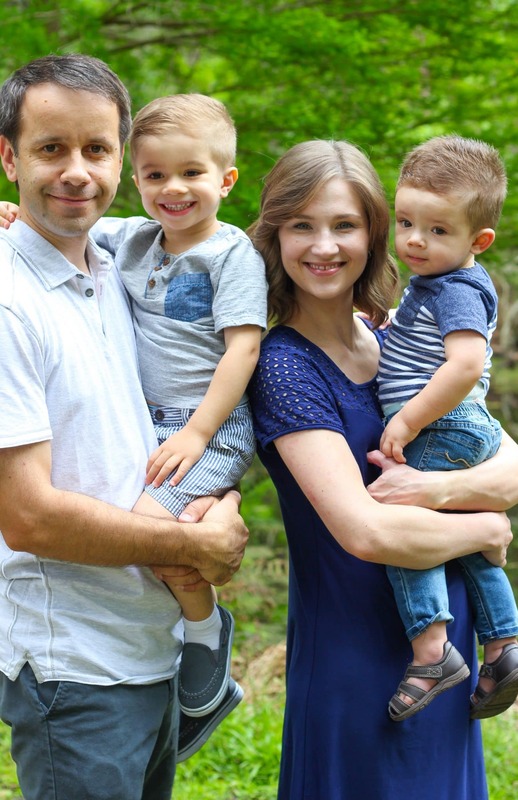 Photography never came naturally to me, but I knew when I started this blog that I would have to learn. For myself, I know that I am more likely to try a recipe if the pictures look mouthwatering, than if there aren’t any pictures included or if the pictures don’t look so great. I learned a lot about food photography from the internet. If you’re interested there is SO much information available. We also bought a bunch of books about food photography. It’s also a lot of trial and error:). We take a lot of different shots and throw out a bunch of them. Olga, I have expiring milk sitting in the fridge. Is it ok if I use the old milk to make tvorog or do I need to use fresh milk? Hi Vera. If you’re using regular store-bought milk and it already tastes funny, I wouldn’t use it. However, if it still tastes fine but the expiration date is just about to be overdue, you can use it. I make a lot of Cheddar pressed cheeses. I use slightly souring milk all the time to make Farmers Cheese; it is the BEST! 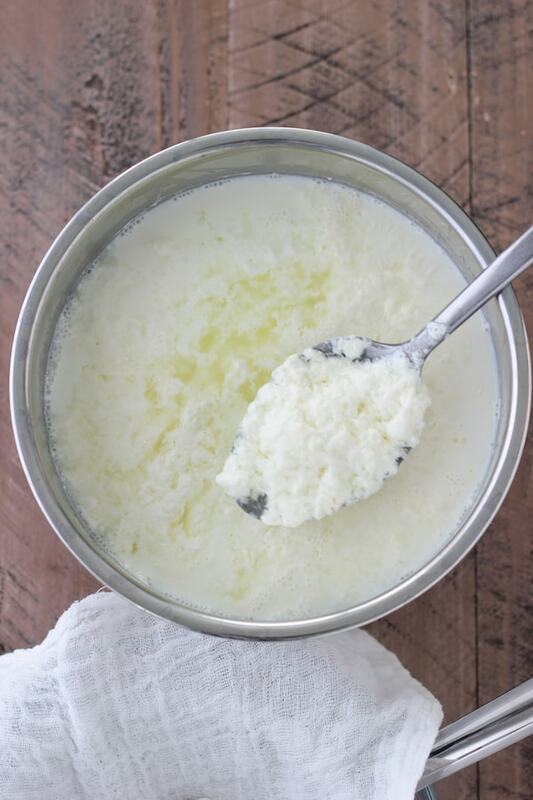 You don’t have to add any lemon nor vinegar as the lactic acid is already starting to inhibit the acidity that you need to make Farmers Cheese or Cottage Cheese. That’s so awesome, Terri! I admire that about you. Thank you for share. Mozzarella and cheddar are on my to-do list for sure. I’d love to learn make them from scratch. My Mom used to make farmer’s cheese with slightly soured raw cow’s milk all the time and it was the best! She never used lemon juice or vinegar either. Unfortunately, using store bought milk is a hit or miss and I found that I usually had to use the lemon juice for consistent results. I would love to find a farm where I can buy cow’s milk. It would be awesome. what do i use the whey for… and how? I use the whey to make flour or crepes. Just substitute the whey for the water in your recipe. How long does the Whey stay fresh in the refrigerator? I really don’t know. I usually use it up within a week, Lena. Whey that has not been cooked will last up to 6 months in the fridge. OR you could freeze raw whey in ice cube trays etc. just measure out how many tablespoonsful it takes to fill an ice cube space. so you know how many cubes to thaw out for recipes etc. but I have never had whey that has been cooked. so I could not say. Also is it possible to make this Farmers cheese without cooking it?? (Or is that called yogurt cheese?.) because heat will damage the health benefits of the milk and therefore cheese. To make farmer’s cheese, it’s necessary to cook the milk, otherwise it will not coagulate properly. Hi OlgaK7, Thanks, for responding to my question so quickly. so the milk has to coagulate to make the farmer cheese. and to make real cream cheese &/or yogurt cheese you use clabbered milk.? new to this cheese making fermenting, clabbered milk thing. How I use whey? I agree with all of you and would like to add more uses. We make homemade farmer’s cheese very often using regular milk+ buttermilk or dry milk + buttermilk sometimes sour cream or my Mom make it add to milk homemade kefir( she has закваска for buttermilk. 1.Once I made Holodnik and didn’t have any lemon at my home I add some whey it turned so good and now I always use it instead lemon juice. TRY IT!!! It good source of calcium. You can even drink it. 2. I always keep in my refrigerator to bottle fresher whey I use for cooking(pancakes, bread,Holodnik or Spinach Cold Borsch or drink)Older from 2-3 weeks to 2 months I use as a mask for my hair. My Mom was capture at South of Russia during Stalin’s repression. She point that Usbekian women( they have beautiful big hair wash their hair with whey from horse or caw milk. If you have time just wash your hair with shampoo, then apply one or more cup of whey to your hair and leave for 15 or more minutes( more you wait better result). Your hair will look healthier, shiny and silky and easier to comb. 3. Don’t toss bad whey, if you have fruit tree or some berry bushes toss it under them. They love everything sour. 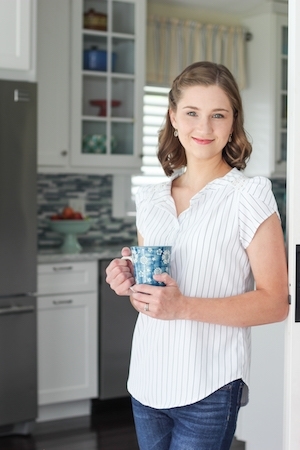 Thanks for sharing so many great tips, Nina! You’re very creative and resourceful. I’ll have to try them out. Olga, I wouldn’t recommend using 1% milk. I’ve used 2% before but you will have a very small amount of cheese and the texture will be less superior. I’ve never tried freezing it, but I highly doubt that it would work. Hi Olga, I tried to make your recipe with whole milk. It came up with a creamy sour cream texture and a taste of a fresh milk, not like a sour farmers cheez. What I did wrong? I’m not sure what could have gone wrong, Yulia. Maybe you needed to add more lemon juice, or heat it up longer. Hi Olga, i’ve been craving tvorog for so long! And i am so glad you shared this easy, fast recipe. After 6.5 years i am having tvorog! This morning i took tvorog, a half of what i got from a gallon of milk, add an egg and sliced banana, mixed it in food processor, formed little patties and pan fried them like “tvorozhnie sirniki”. It was delicious! Gluten-flour-free! No need for syrup, since banana adds that sweetness. And your tvorog – is so delicious and tender, soft and creamy. Love it! Thank you! I feel like a super-wife! Great idea with the banana:). I’ll have to try it. How much cheese (weight/ cups) do you get from 1 gallon of milk? 1 quart is equal to approximately 4 cups. However, that is not the exact amount. It depends on the milk that you use how much cheese you will end up with. If you use lighter milk, you will not get as much cheese as when you use whole milk, etc. Love making farmer cheese at home as well! whey btw is a great facial cleanser! Good to know:). I’ve heard of people washing their face in buttermilk; I guess whey is similar in some way. Hi I love your recipes and stories but I would like to know if I can halve the recipe as there are just three if us in my household thanks.keep up the great satisfying work olga. Yes, you can halve the recipe. I’m glad you are enjoying the blog. There are only the two of us, my husband and myself, and we have no problem using up the farmer’s cheese:). Thank you for the recipe. Could you please leg me know as how much in ml is a gallon of milk. Hi olga, this is interesting, i never heard of lemon being used. I make it with 1 gallon of milk, heat it up just until warm, take it off the heat add 2 cups of buttermilk. and cover and let it stand for 2 days. Then warm it up on low heat for an hour without mixing. and voila. 🙂 takes a bit longer then yours but also super easy. Will have to try your way for sure. There are also different health benefits to the whey, believe it or not it helps heal poison ivy! just apply it to the skin!!! 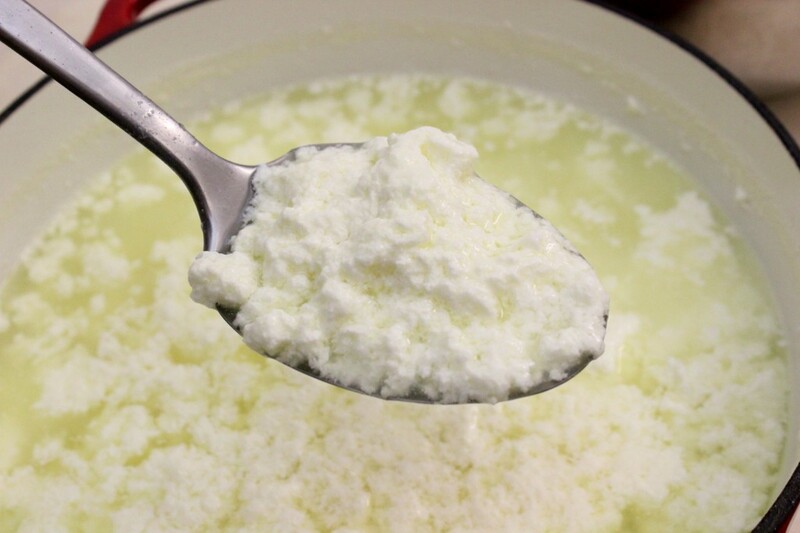 My Mom used to make farmer’s cheese with buttermilk or sour cream. 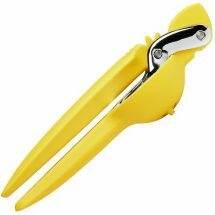 I really like using lemon juice because it’s so quick and I usually have lemons on hand. I like to use the whey to make bread or crepes. I never knew that it was good for poison ivy. That’s awesome. Thanks for sharing, Anna. Thanks for the recipe Olga! Question: Do you have any tips on what to do so the bottom of the pot doesn’t burn? Also, do you warm it up on low or on medium heat? And when exactly to take if off if i don’t have thermometer to check if it’s 185 degrees or not. Thanks a lot! 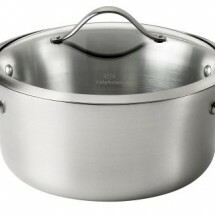 First of all, you need to use a good quality pot, that has a heavy bottom. If the pot is thin, it will burn no matter how careful you are. The temperature of the heat depends on your stove and your pot. You will need to adjust the heat depending on that. It would be very hard to tell how long to cook the milk without using a thermometer. I’ve never done it without a thermometer. 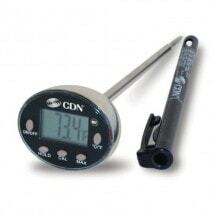 Instant read thermometers are very inexpensive and I use mine all the time. Thank you for posting your recipes online. I use your recipes to make yummy things. Your Farmer’s Cheese recipe is awesome. God Bless you and your entire household. You’re welcome, Tanya! I’m so glad that you are enjoying the recipes. Thank you for taking time to write. Just want to thank you for this easy recipe. For years I used the method of milk and buttermilk. Unfortunately last 3 attempts I ruined it. (Maybe cause my placenta brain ) today I followed your recipe and I love it. It’s ready in one day and so good. How long should i drain it for to make it softer and less drier. You’ll just have to use your judgement, Inna. Look at it, touch it and stop draining it once it’s the consistency that you are looking for. My cheese turned out! After I added the lemon juice, only the foam cured. So I heated it again and added lemon juice again. Nothing. THEN… I added 1-2 cups buttermilk and that did the trick!!! Thank you so much for this! I was using a similar recipe but needed to do some troubleshooting and your tips and photos made my cheese a success! I am signed up for your updates and look forward to more recipes. Using my farmer’s cheese for my first homemade pierogi for Christmas Eve. I’m so happy to hear that, Corrine. I’m thrilled that it worked out for you. Homemade pierogi’s are awesome. I’m sorry to hear that it didn’t work out for you, Tatiana. I shared the recipe the way I make it and the way it works out for me. The problem with heating the milk on high heat is that it has a tendency to scorch, but if you stir it constantly, it should be ok to heat it on higher heat. 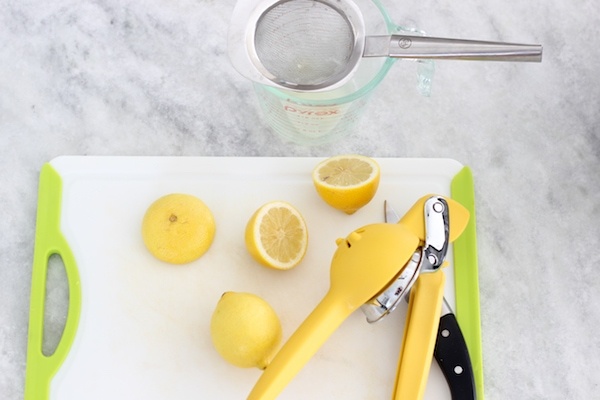 I like using lemon instead of vinegar; if it doesn’t curdle right away, you may need to add more lemon juice. Try keeping it on the heat and gently stirring it for a minute or so after you add the lemon juice. I hope that helps. Thank you Olga for this great recipe.I made it already few times over last couple of years and it never fails. Hi Olga, I hope you are doing well at the end of your pregnancy!! Gods blessings to you!! I have a question that hopefully you will be able to answer when you have some time. If I don’t have lemons, can I use lemon concentrate, and how much of it? Thanks! 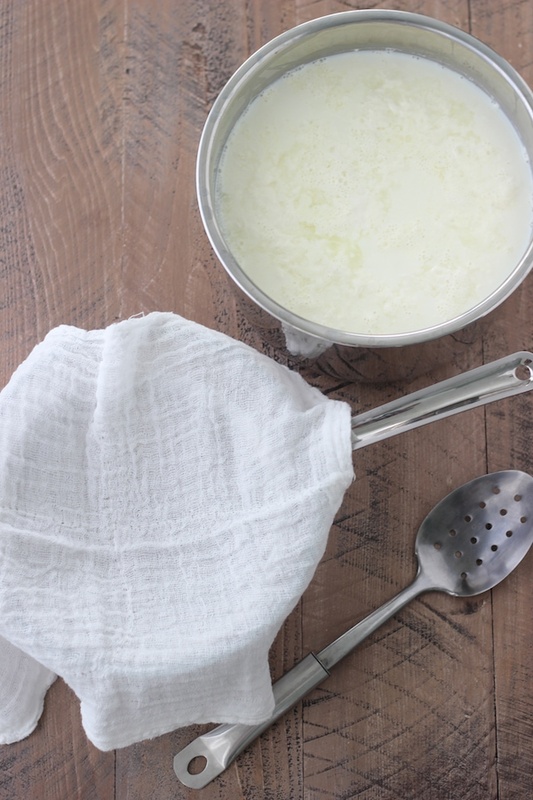 Put to cheese cloth, drain for 15 min – voila! 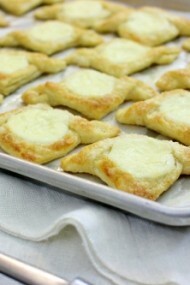 The reason to put heavy cream – ricottas have higher fat content than farmer’s cheese, giving them that texture. Also, by adding vinegar instead of lemon juice you get better, more consistent results. 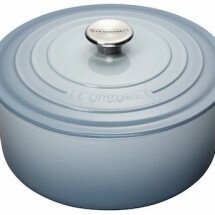 Also, you got to make it in cast iron (Le Creuset or similar) pot – it keeps consistent temp, without burning the bottom. 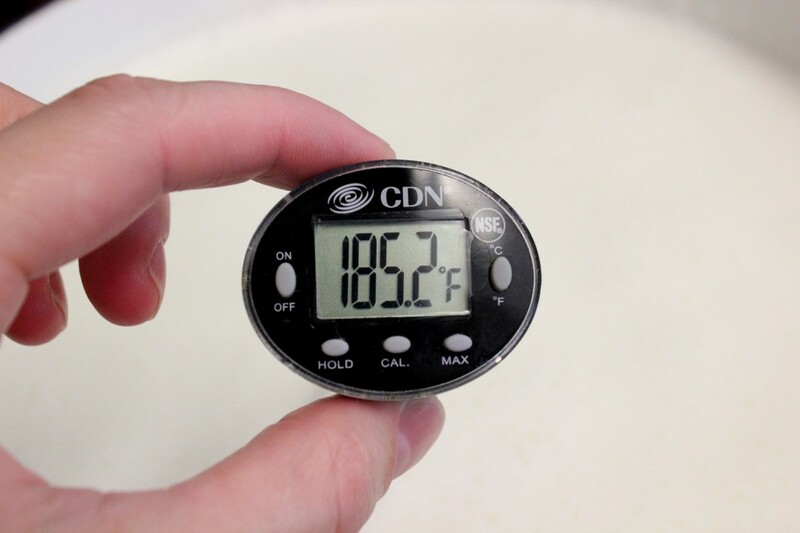 The final heating temp will result in texture: with slightly higher temps there will be more defined clumps, hence dryer ricotta, with less heat – smaller grains – creamer ricotta. It’s all about fat content and right heating temp. Thank you for sharing, Victoria. Absolutely amazing recipe! And so easy! Love how creamy it turns out. Ever since you posted your recipe I’ve made it several times already:) thank you! I’m so happy to hear that, Zhanna. I make it almost every week too, since my husband and boys love it so much. 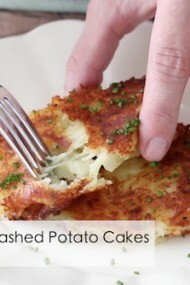 I really want to try this recipe in a few days. But I was wondering if I can make half the recipe. So just devide the amounts in two? Thanks! Yes, not a problem, Minke. Hi I made this today in the instant pot. It turned out great 👍🏻 my question was about the color of the whey. When I made yogurt in the instant pot the whey turned out clear and more greenish in color. This whey was more cloudy and yellowish in color is the how it’s supposed to be? Or was it because the milk did not completely separate? The whey should be more on the clear side. If it looks kind of “milky”/cream colored, that most likely means that it didn’t separate enough and you could have gotten more cheese out of it, Yuliya. Okay. Thank you Olga for your response. 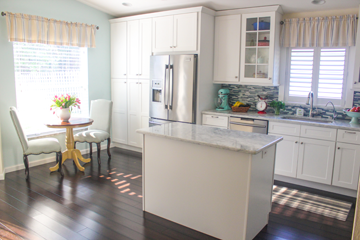 I am very thankful for your blog, we enjoy your recipes weekly! Thank you for teaching me how to cook well! Put it back on the heat for a few minutes, mixing gently and you should see it curdle a lot more and get a significant amount more cheese:). Hello. 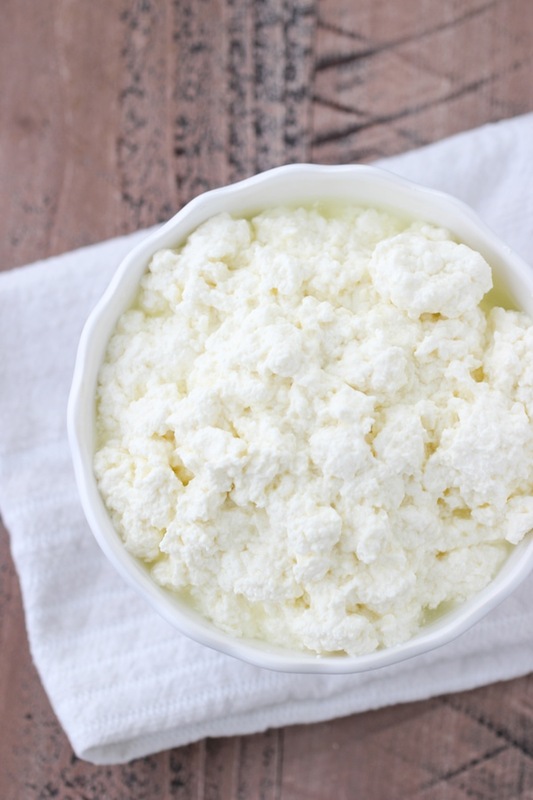 I’m excited to try this recipe – I love ricotta and would like to try making my own. Before I start I have one question please. I’m planning to make this in my instant pot using the yogurt button. 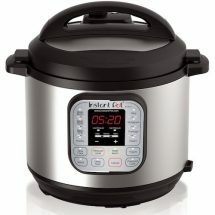 When you say take it off the heat is it enough to turn off the instant pot or do I need to take the inner pot out of the instant pot? Thank you! 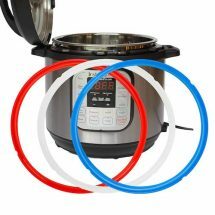 You don’t have to take the inner pot out of the Instant Pot. As you can see in the pictures, I am adding the lemon juice without taking the inner pot out.